"When it comes to running HTML5 content on a mobile browser, it looks as though Microsoft is setting the pace with its Internet Explorer 9 and Windows Phone 7 combination. The key factor? Hardware acceleration in the browser. A demonstration given during MIX11 in Las Vegas today pitted an iPhone 4 and Nexus S against a HTC Windows Phone 7 device. iOS vs. Android vs. Windows. 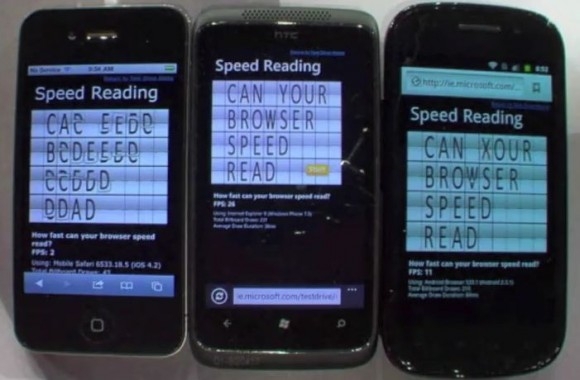 The test was called HTML5 Speed Reading and performed a render test. The clear winner was the Windows Phone running IE9 due to the fact it takes advantage of hardware acceleration." The test was run during Microsoft's recent MIX11 event in Las Vegas. While these sorts of tests are always open to criticism by one camp or another, we can safely conclude that hardware acceleration will be prevalent in the year's ahead. It does seem to have a very positive impact on render speed. It will be interesting to see how all the platforms increase performance using this technique and other approaches in the next year or two. The problem with this test is, that it shows performance of a FUTURE WP against CURRENT competition phones. WP7 shown here is due by the end of the year, if we are lucky. In the main time new iPhone is due this summer, and Google keep on baking new versions of Android every 6 months. I doubt competition will just sit and wait for MS finally do something interesting. By the time this Mango update/ headsets come out, all this "superiority" will be nothing more, than a catch up game, that MS really good at.